Boston, MA Wilder, a national retail real estate leasing, management, and development firm, has promoted Bridget Beckeman to managing director, retail strategies. Beckeman is responsible for coordinating and executing redevelopment and repositioning plans across the Wilder portfolio to address the changing retail climate. Wilder is at the forefront of transforming retail properties to mixed-use destinations. Beckeman’s experience in retail, office, and residential provides a vantage point to assess these redevelopment opportunities. Utilizing Wilder’s in-depth experience and the vast trove of consumer data now available, Beckeman’s team specializes in developing comprehensive long-term asset strategies that benefit both the community and Wilder’s partners and clients. Currently, Beckeman is spending time on Arsenal Yards, Wilder and Boylston Properties’ $400 million mixed-use development in Greater Boston, in addition to Wilder’s newest assets in Pennsylvania and Maryland. 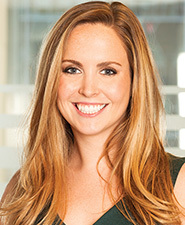 Joining Wilder in 2018, Bridget was previously with Jamestown, LP where she was responsible for the company’s New York City mixed-use portfolio, including Chelsea Market and One Times Sq. Prior to that, she was an analyst on J.P. Morgan’s Global Real Assets team.